ErgoMine is an ergonomics audit tool designed specifically for mining. It includes audits for bagging, haul truck, and maintenance and repair operations at surface mining and processing facilities. Based on your responses to the audit questions, ErgoMine provides recommendations when there is an opportunity for ergonomics improvement. Once you have completed an audit, you can review the recommendations on your mobile device or you can email the recommendations to the recipients of your choice. What are the benefits of conducting an audit? 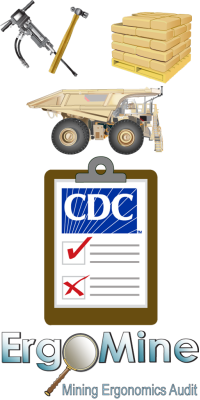 Most mineworkers can conduct ergonomics audits reliably with a well-designed audit tool. The audit can be even more thorough than one conducted by an expert practitioner with respect to identifying ergonomics deficiencies in the workplace. ErgoMine can benefit your mine site by allowing workers without formal ergonomics training to identify issues and mitigate risks. You can also use ErgoMine to conduct audits before and after you make changes to the work environment to determine the impact on the workplace. Refer to the Help Guide for an overview of the features and functions. ErgoMine 1.0 is developed as a mobile application for the Android platform. Using an Android device, use the direct link below to the application's Google Play store page or go to the store and search on "ErgoMine" to locate and install this program. NEW: The audits are also provided in PDF format for printing and use in the classic clipboard-and-pencil style. Pittsburgh, PA: U.S. Department of Health and Human Services, Public Health Service, Centers for Disease Control and Prevention, National Institute for Occupational Safety and Health, DHHS (NIOSH), 2016 Apr. Pittsburgh, PA: U.S. Department of Health and Human Services, Public Health Service, Centers for Disease Control and Prevention, National Institute for Occupational Safety and Health, DHHS (NIOSH), 2016 May.